The Republic of Bashkortostan (Bashkiria), nicknamed the “Russian Switzerland” because of its natural resources, is discreetly developing its tourist potential, far from the beaten track. Slowly but surely, the people of Bashkiria are regaining consciousness of their national identity within the Russian Federation. For a number of businesspeople, tourism has become a way of enhancing the regional heritage and accelerating a return to its roots. The people of Bashkiria are a semi-nomadic people who were “Islamicized” in the 20th century, settling mainly in the southern Urals. The Bashkirs boast of being the only people in the Russian Empire who were never enslaved. Now they need to free themselves of the tyranny of oil extraction (60 percent of the local economy); they need to diversify before it is too late. Burzyanski District, where his ancestors lived, has splendid landscapes (it has been nicknamed “Russia’s Switzerland”) and enough fauna and flora to attract the most demanding nature-lovers. The Kapova Cave on Belaya River is nearly 2 miles deep and contains Palaeolithic cave drawings that are some 14,500 years old. It truly is a sight not to be missed. Bashkortostan is not mentioned in the Bible, but it is certainly the Russian Federation’s “Land of Canaan,” since it flows with abundant milk and honey. There is oil as well—but that is another story. Bashkortostan is the leading producer of milk in Russia, and its honey, like that of Altai, has a great reputation. All these treasures are concealed in a well-hidden secret. 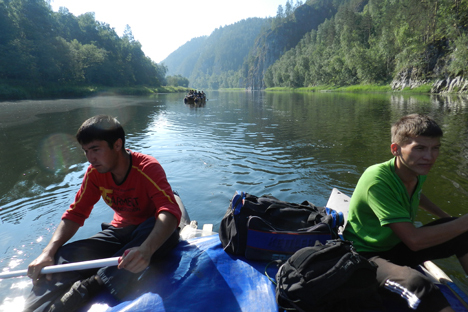 So who dreams of spending their holidays in Bashkortostan? One of the main obstacles to the development of tourism is the lack of transport infrastructure. The roads are in poor condition. To reach Burzyanski District from Ufa’s airport, you have an uncomfortable, three-hour journey. When questioned about improving the road network, the head of the Bashkir government, Rustem Khamitov, conceded that the $15.1 million spent each year will not solve the immediate problem. “We can’t increase taxes. But we are calling upon more skilled construction companies than we used in the past.” The governor remains cautious about the development of tourism. “There won’t be any major changes in the next five years,” says Khamitov. While officials try and assess the prospects for tourism, a handful of entrepreneurs have already laid the groundwork. “We are now relying on the federal plan to develop tourism, which ought, in principle, to take over the infrastructure financing for the best projects,” Yulbarissov says. He and his colleagues are aware that this may take some time. It will either take infinite patience, or they will have to do everything themselves.